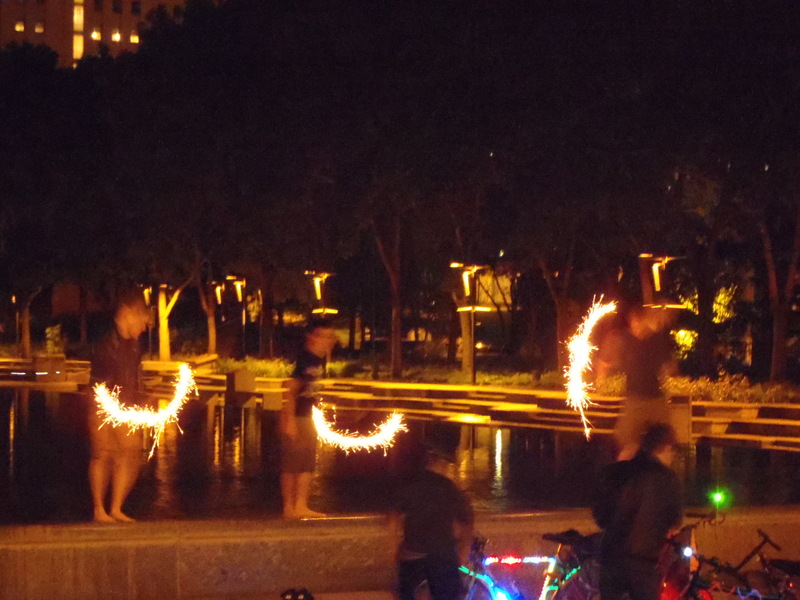 What is the best night to attempt cycling through all the hours of the night.? On the shortest night of the year, of course. If one wanted to be really tough they could try it on the longest night – but it’s cold in December and I ain’t that ambitious. 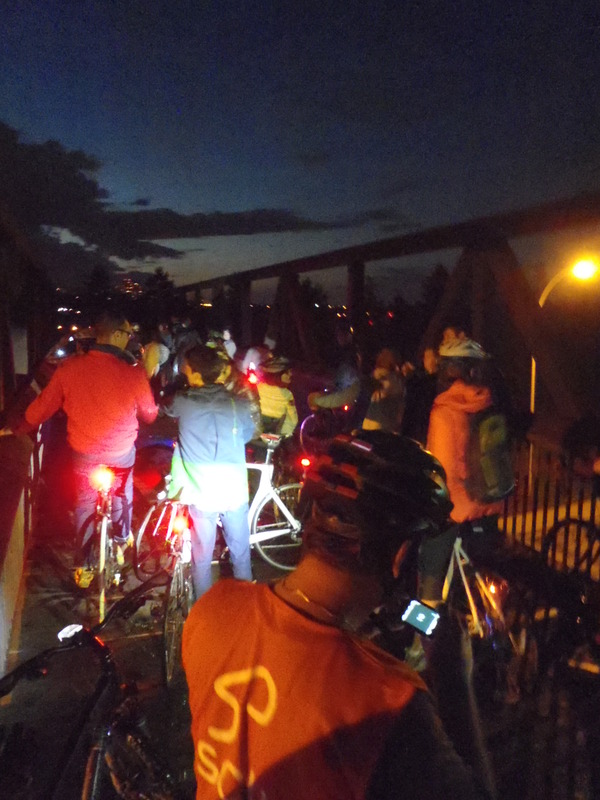 Friday night, as one of the many Bike Month activities, the Edmonton Bicycle Commuters’ Society organized a Midnight Mystery Ride. 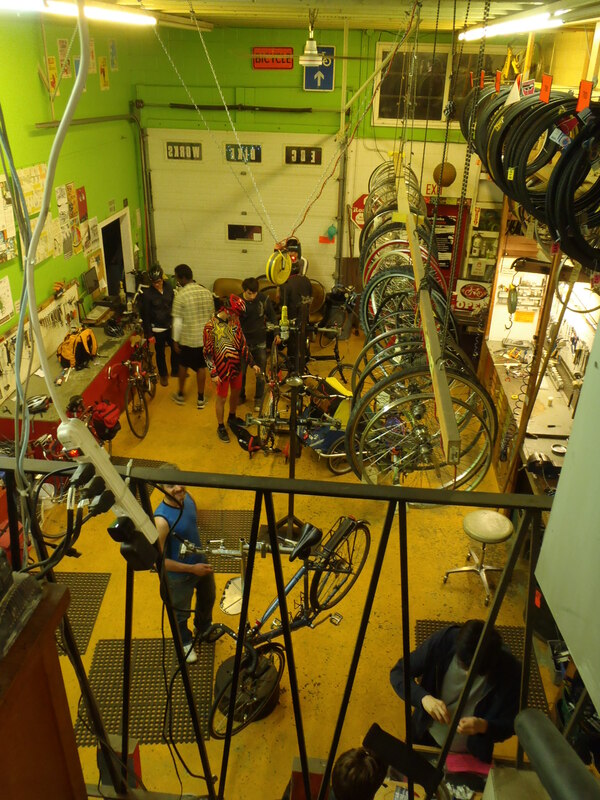 At Bikeworks South, more than a score of cyclists assembled in a flashing,blinking, strobing pack of nocturnal, urban explorers. 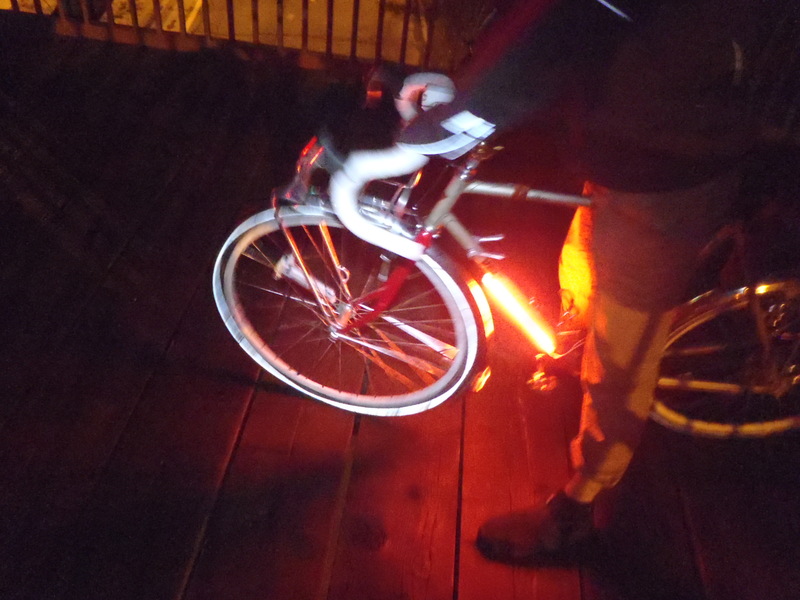 The plan was to was to cruise the streets into the wee hours of the night. 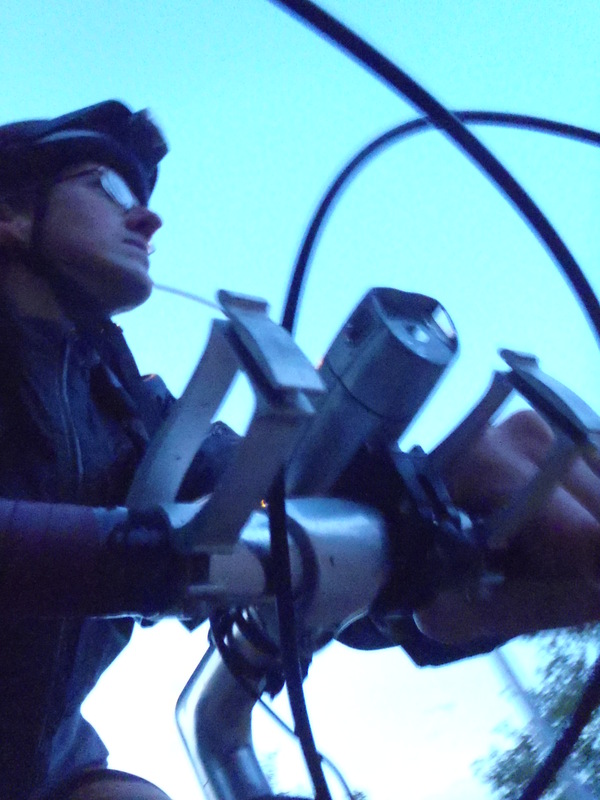 My own personal goal was to ride until sunrise – a sort of solstice cycling vigil. 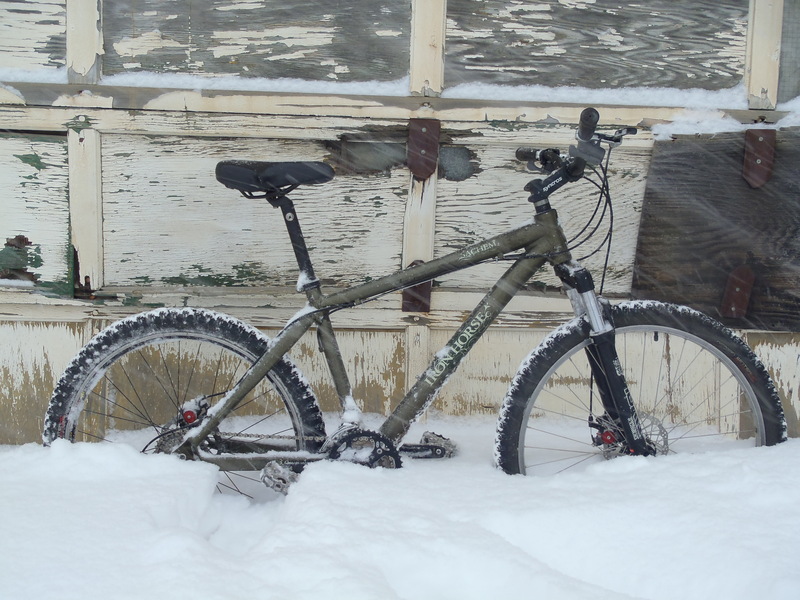 The weather was ideal for the expedition. A thunderstorm had rolled through earlier in the evening leaving behind rain-swept streets, cool air and clearing skies. 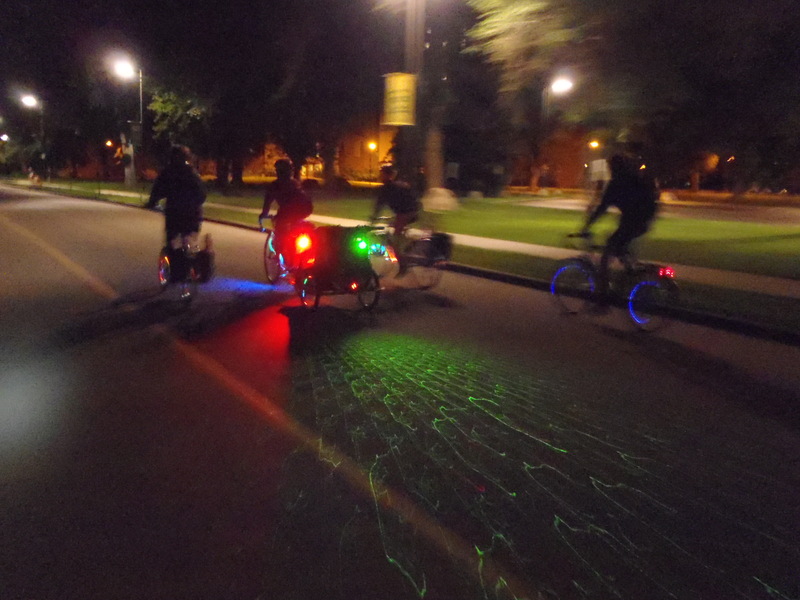 We started our ride by travelling down Whyte Ave, Edmonton’s main strip of bars and nightlife. 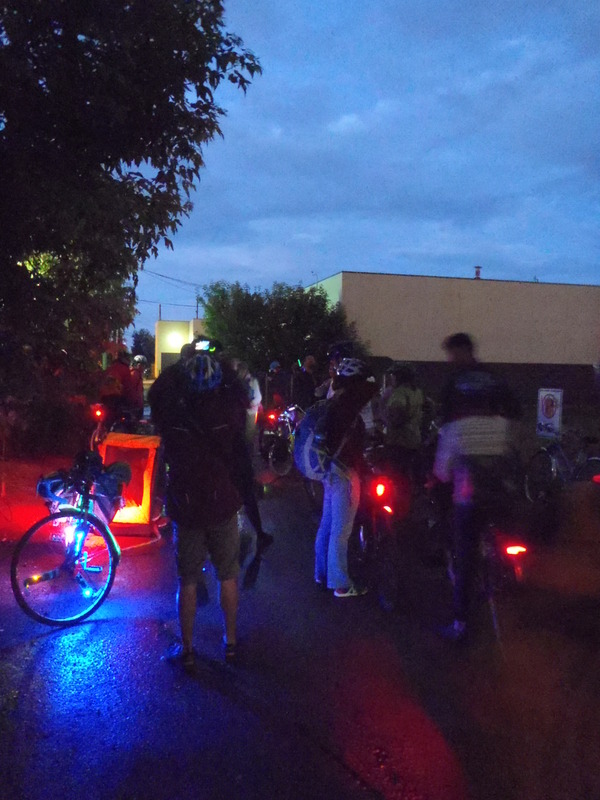 One of our fearless leaders was pedaling his fantastical light bike and towing a trailer equipped with a music blasting boom box providing a soundtrack for the ride. 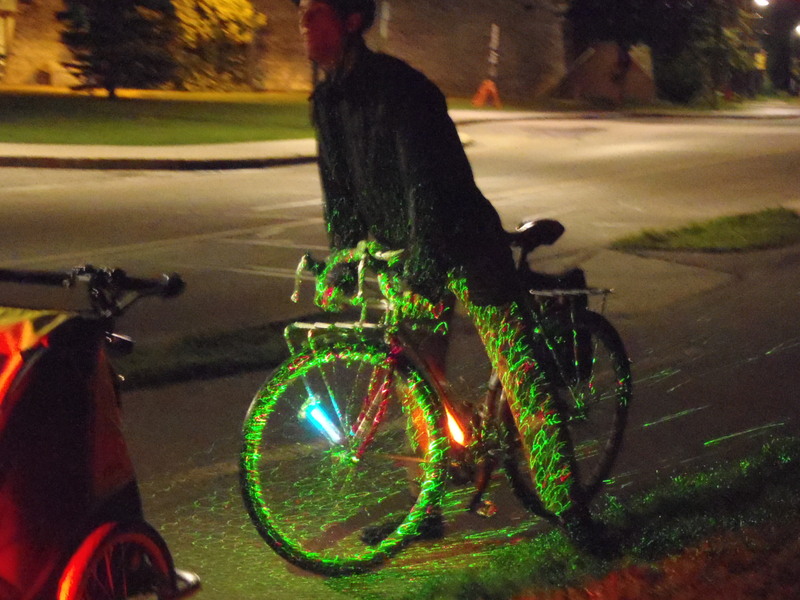 He’d also hooked up a laser effects-box that beamed a light show on the road behind him. There’s no doubt that we were a head-turning, attention-grabbing spectacle and throughout the ride there were many shouts of encouragement from drivers and pedestrians. We traveled down through Mill Creek ravine, past the Muttart Conservatory where we paused for some photos, and onward to the pedestrian bridge where we stopped for more photos and some refreshments. You can see one of the group photos here. 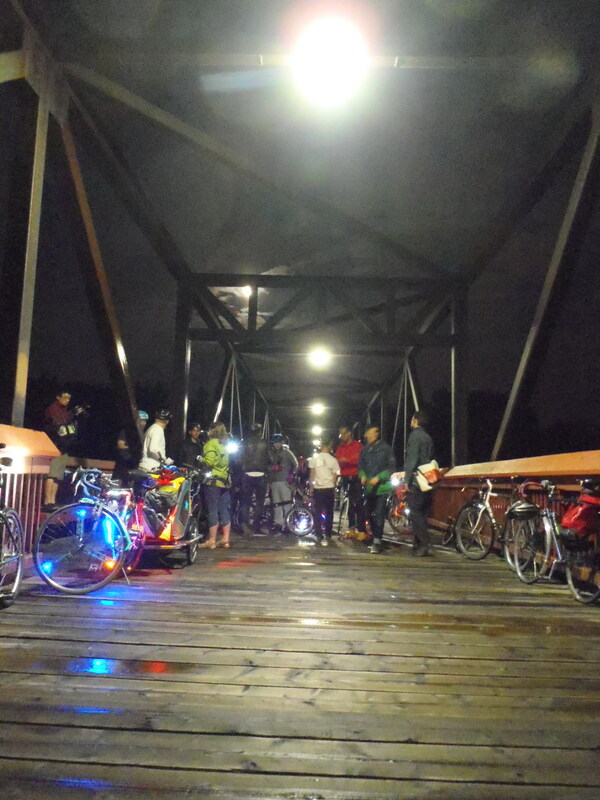 I took very few photos while actually riding as I was simply not up to the challenge of trying to capture unblurred night pictures while also controlling my bike in a largish group. 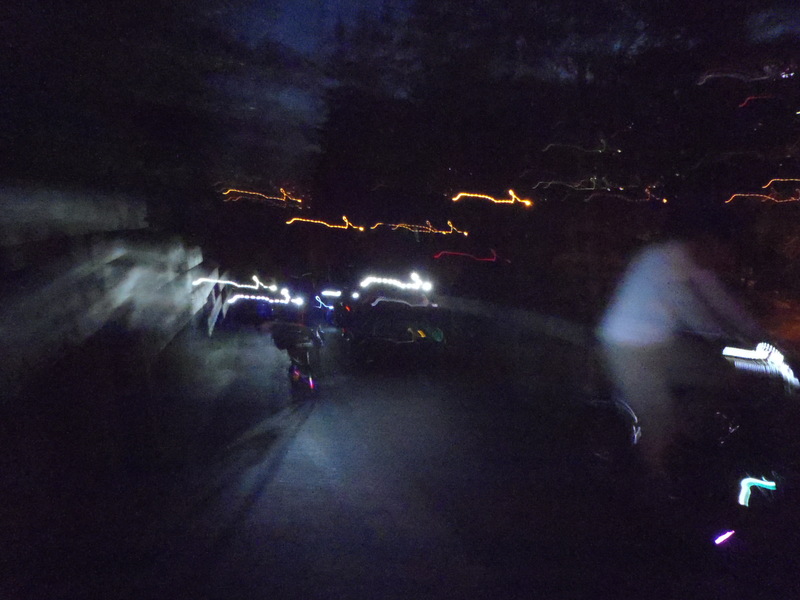 Most of my riding photos turned out like this. Next we headed up the serpentine path through the Chinese garden in a sinuous glowing line. 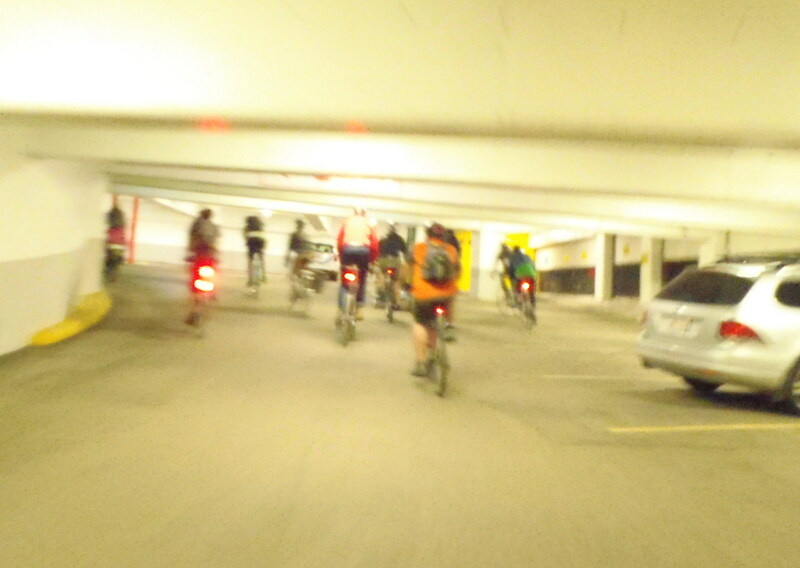 We cruised through downtown and up to the top of one of the parkades looking down over the city center.Swooping along under the low ceiling was a blast but I’m glad I wasn’t the one pedaling the heavily laden trailer through all this climbing. 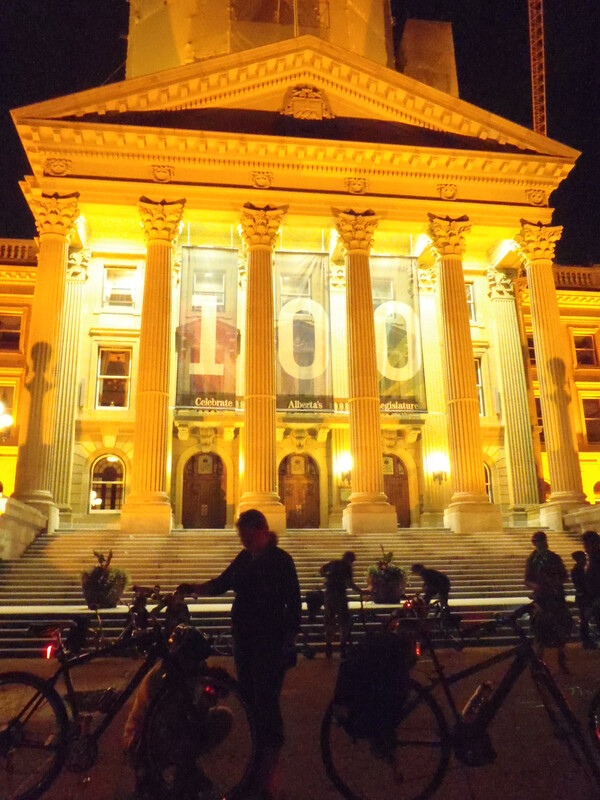 After the parkade we visited the “Tron” building and the Legislature grounds. Fun to ride up. 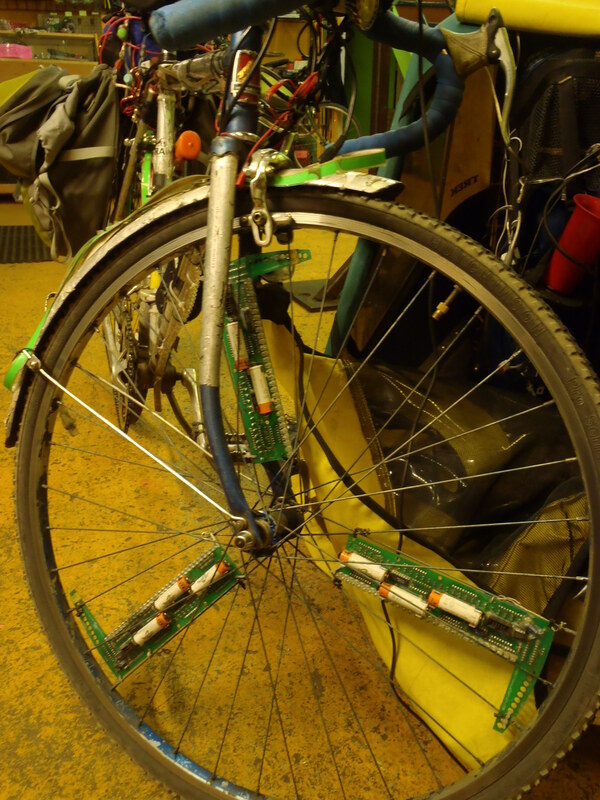 Even more fun to ride down. 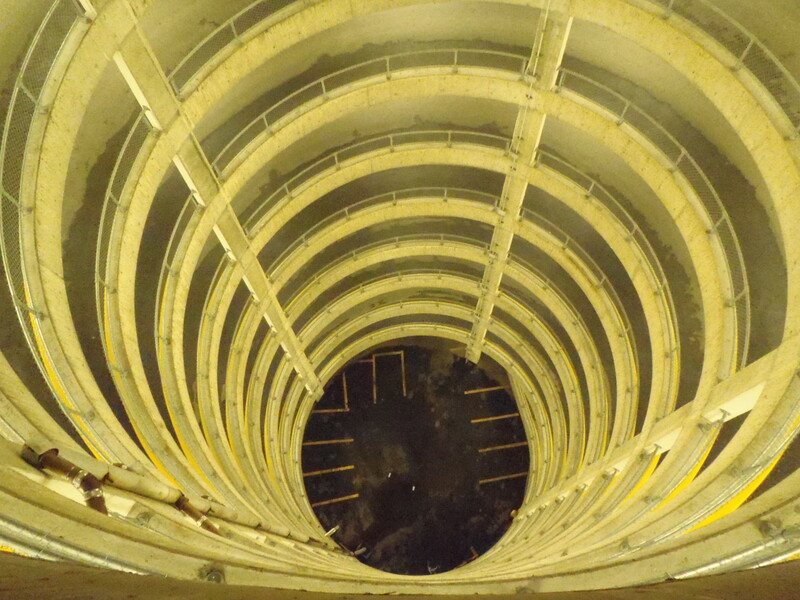 There is an excellent picture of the descent here. 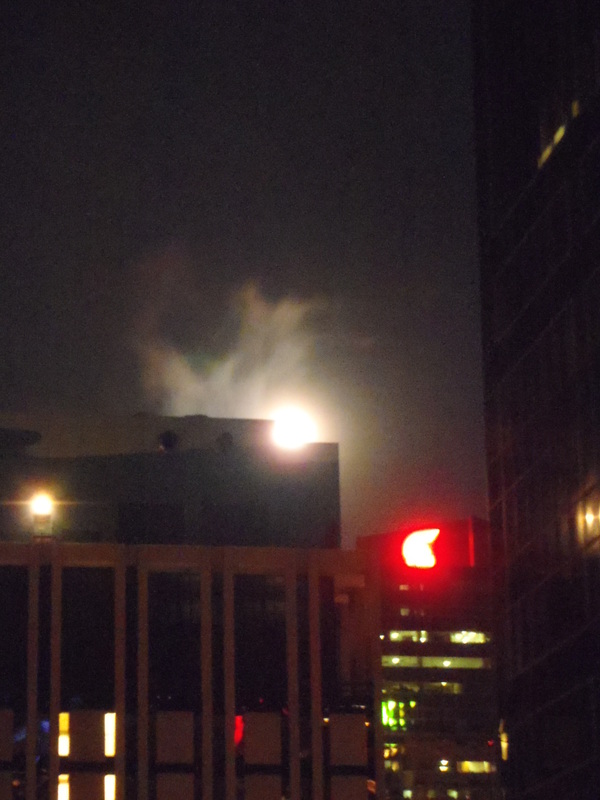 The nearly full moon rising over downtown. A number of people called it quits after the stop at the legislature grounds. 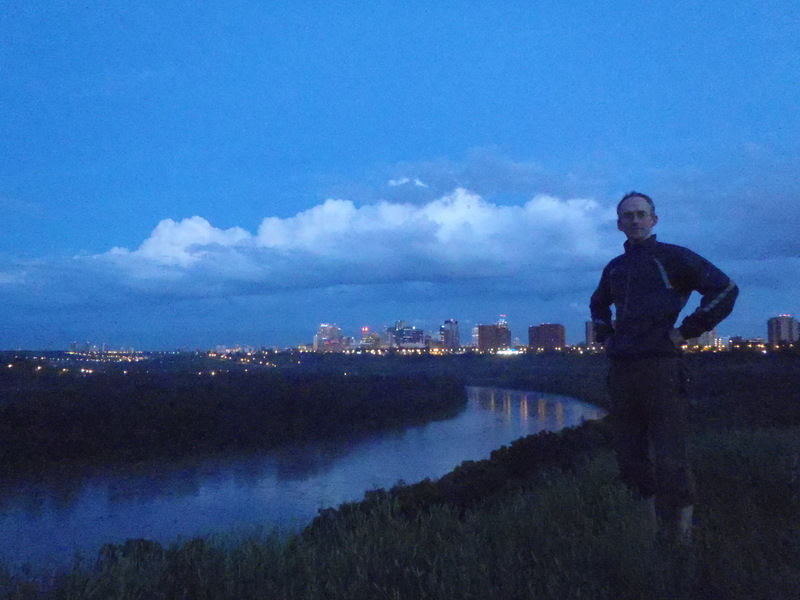 A few more said goodnight after we crossed south over the High Level Bridge, leaving just five of us to wend our way through the University grounds to a location where we could see the lightening sky, distant lightning flashes and a perplexing a meteorological phenomenon. After this we gradually headed to our respective homes. Once I was on own, I headed back towards my own neighbourhood. I plotted a routed through the quiet old residential neighbourhoods before cutting up to speed down 118th Ave. Even at this late hour a few businesses were open, with music floating out and light spilling from doorways onto patrons gathered outside smoking. Scattered pedestrians wandered the Ave. 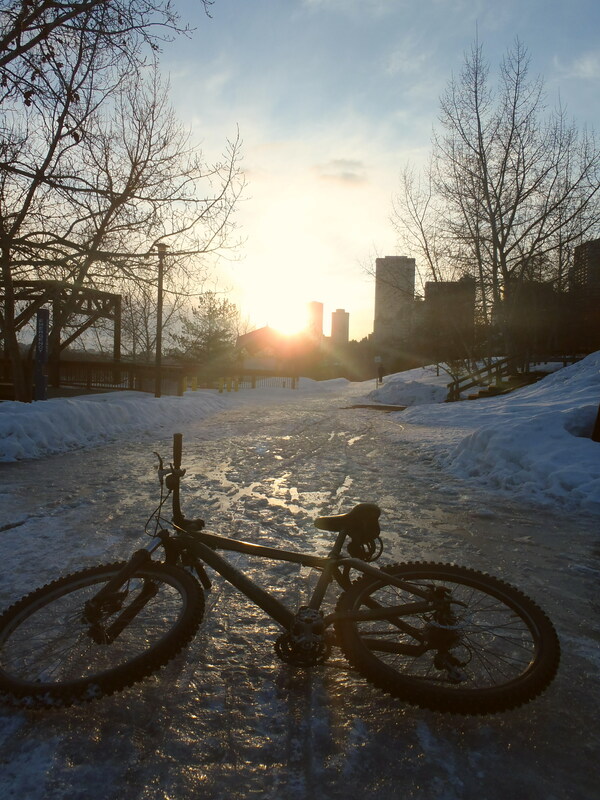 I pushed on towards my favourite local park to watch the sunrise. I am rarely out and about during these late hours and I savored the peaceful and unusually quiet sleeping city. The singing of wakening songbirds rang out in the absence of the normal human made cacophony. It’s been many years since I’ve stayed up all night; I’d been doubtful that at my age I still had it in me. 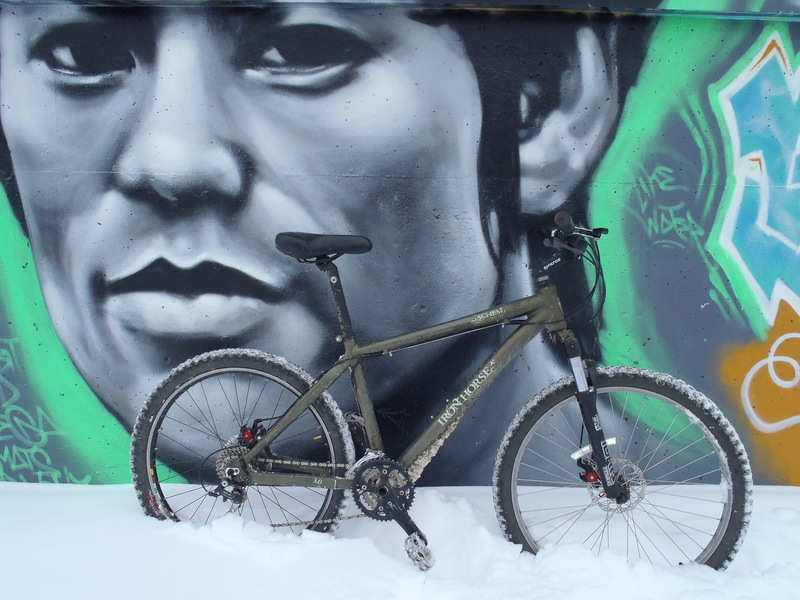 However by sunrise, though my mind was getting foggy, my body was still willing to ride more, leading me to an unsurprising conclusion: bicycles – an ideal stimulant. Little green caterpillars and gentle flurries of poplar seeds are one the annual signs that tell me that summer is so very close to officially arriving. These two make their appearance near the end of spring and signal the end of brisk morning rides and pleasantly warm evenings. The caterpillars are Larger Boxelder Leafrollers and they mostly feed on the leaves of Manitoba Maples. 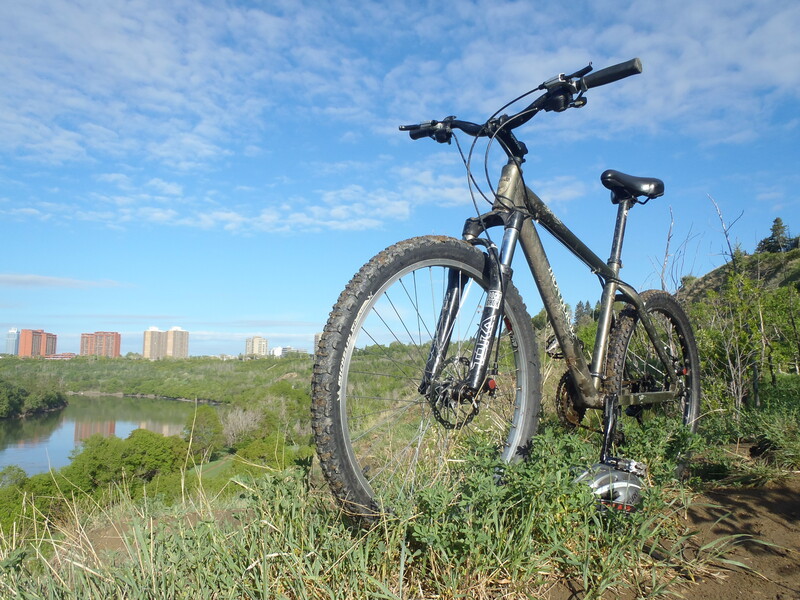 As there are no shortage of these trees in the river valley, Edmonton cyclists using the trails are accustomed to suddenly riding into swarms of the caterpillars . You will be zipping along when the light filtering through the foliage will illuminate a host of little jade Leafrollers rappelling down from canopy above on invisible lines. Attempts to dodge them are futile; you are bound to accumulate a number of tiny hitchhikers. 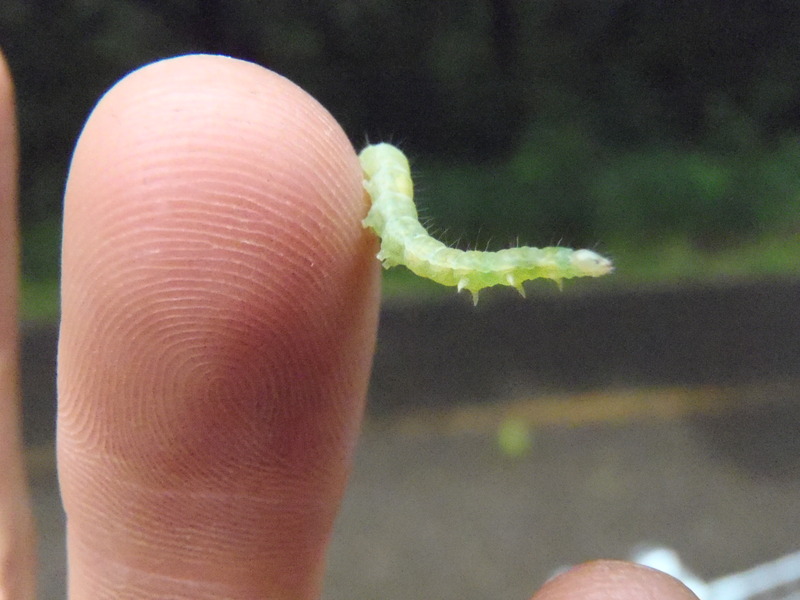 These hungry little critters can defoliate an entire tree. Luckily the weedy Manitoba Maple is such a rugged character that within a few weeks it can grow complete new set of leaves. 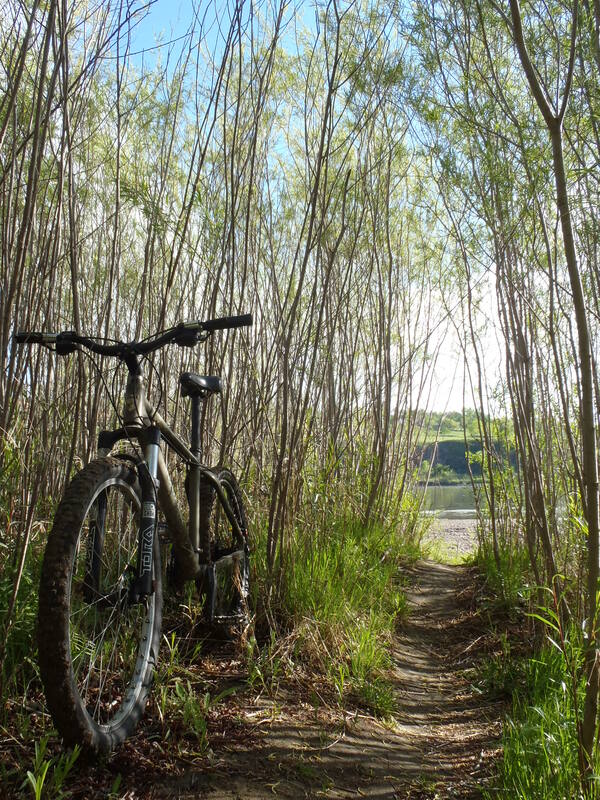 In addition to Manitoba Maples the river valley is well provided with poplar trees. 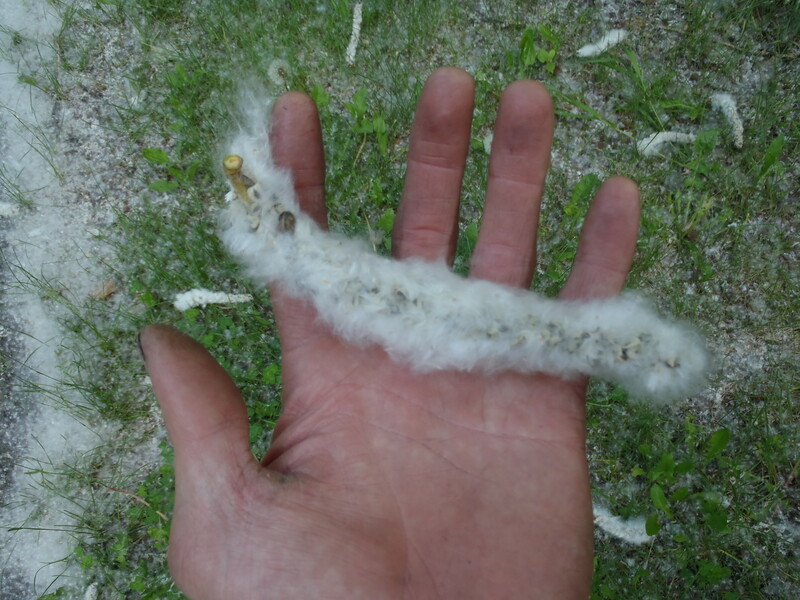 Throughout late spring these trees will form seed pods that release steady flurries of white fluff. It gathers in drifts throughout the woods, sometimes nearly carpeting the entire forest floor. 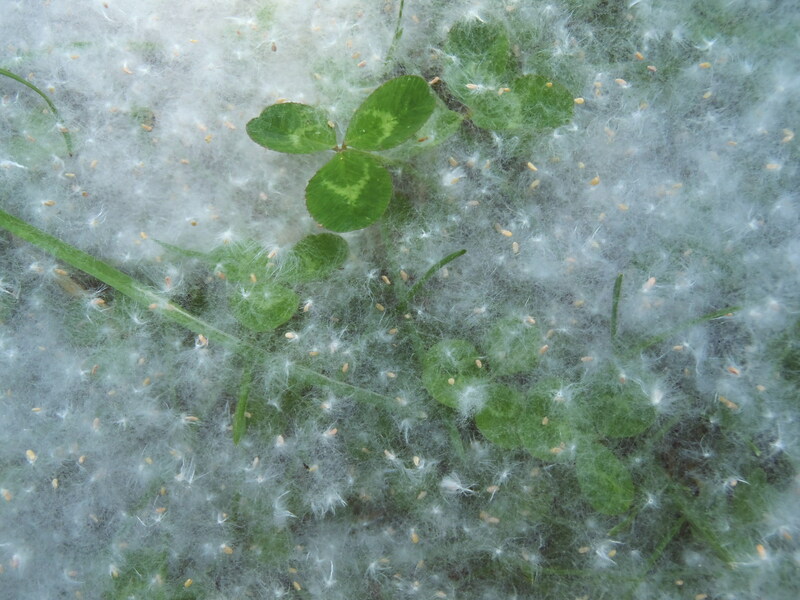 This year we have had so much rain that, although there has been lots of poplar fluff falling, it has not been able accumulate in the cloud-like, landscape-transforming blankets that I love. 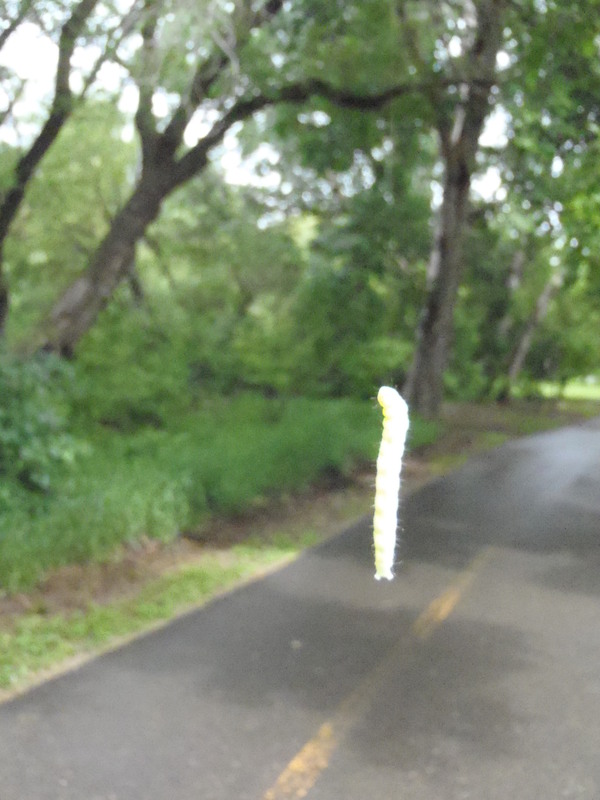 I tried to take some photos of the fluff flurries today but my camera or myself (or both) were not equal to the task. I did take a video, but at the time of writing I don’t have the energy to coax my ancient, hand-cranked computer into editing the file. Please just imagine a juxtaposition of giant snowflakes and vibrant greenery; you will have a good approximation. 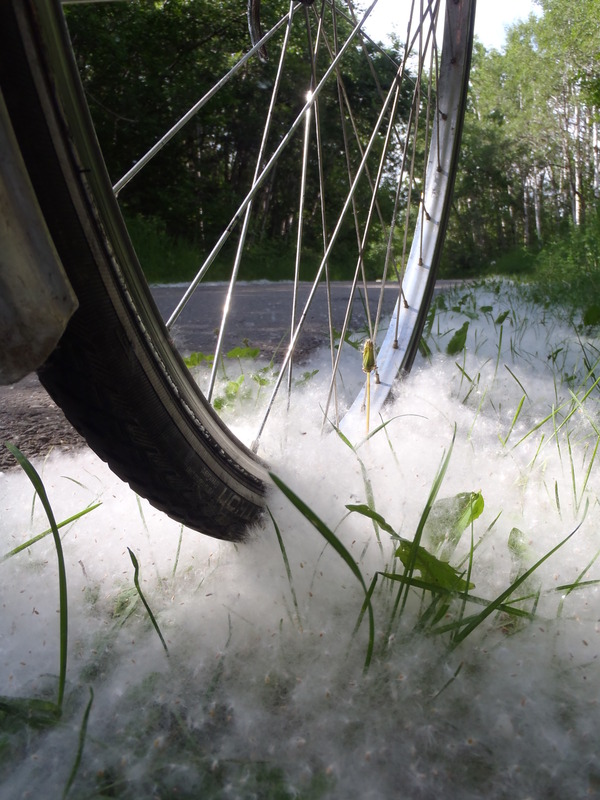 One of my great spring pleasures is cycling through the falling poplar seeds. 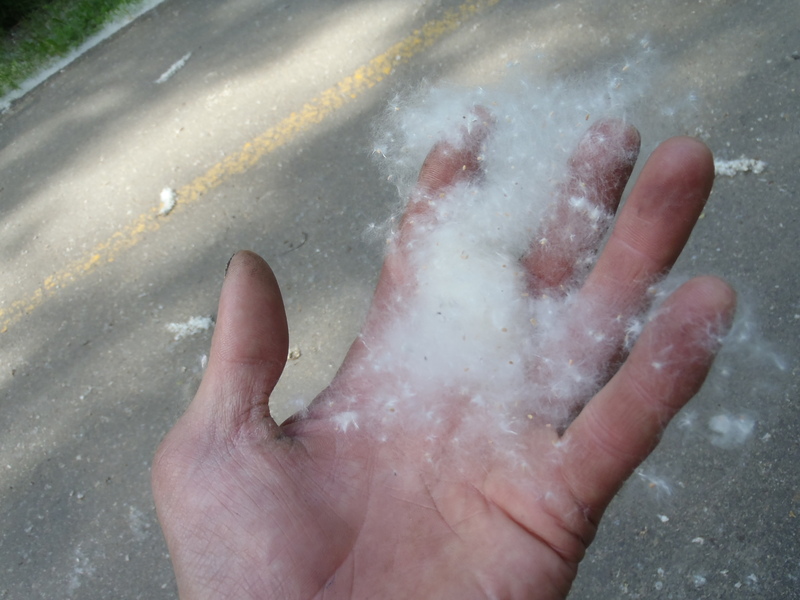 Contrary to many people’s belief, the poplar fluff does not cause allergic reactions: the poplar seed season coincides with the grass pollen season, the real culprit of springtime sniffles. A fallen seed pod. One of many. 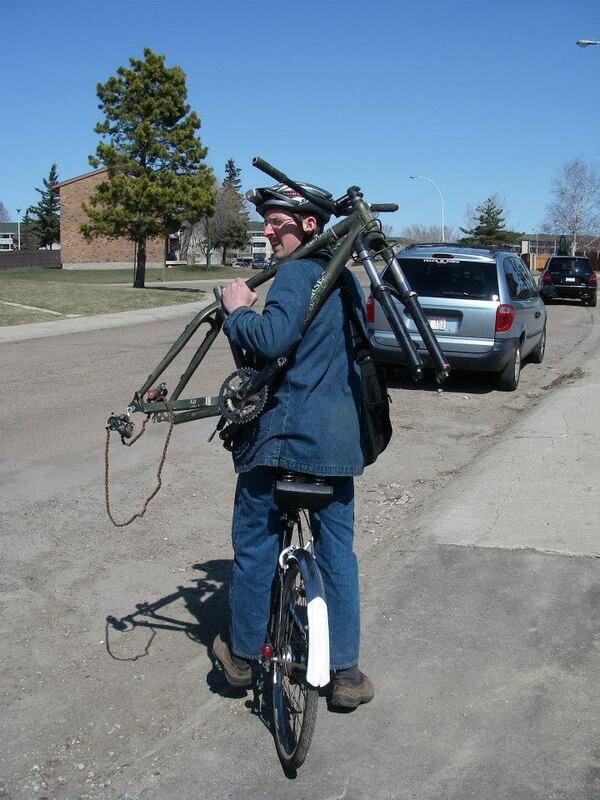 Moments after my taking this photo, my bike fell on top of my crouching self, drawing blood. I hope you appreciate my dedication…and stupidity.